Grenache is one of the most widely planted red wine grape varieties in the world and thrives in the hot summer days of the Sierra Foothills. 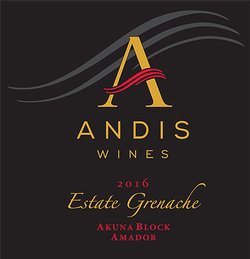 The 2016 Andis Grenache was harvested 100% from the Akuna Block of our Estate Vineyard, named after one of the winery founders Janis Akuna. The vineyard lies in decomposed granite soil in a NORTH - SOUTH direction.